Portland is a foodies delight, and there are more restaurants, bars, diners and food cart pods than you’ll be able to sample in a lifetime. Whether you are an omnivore devouring everything in sight or are a more restricted allergen-aware eater, you’ll still be able to find plenty of places to eat around town. While you are on campus, there are a number of spots for you to grab a meal or an in-between class snack. 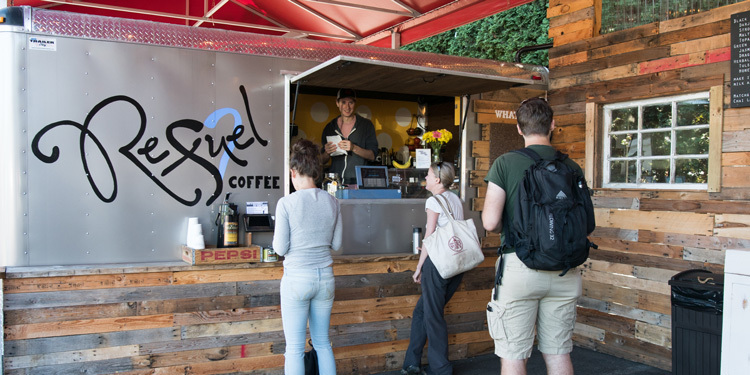 We have food carts located in the west parking lot of campus; our bookstore features snacks and to-go meals from an alumna, and Refuel for coffee, smoothies and more. Just over the foot bridge is Lair Hill Café—an eclectic and funky bistro with salads, sandwiches, soups and a full breakfast menus. They also do a dinner if you’re looking for a place later in the evening. Ross Island Grocery is just down the street on SW Corbett, where you can find sandwiches, soups, salads and yummy desserts. Sushi Takahashi II is a short 15- minute walk away, on 5th Avenue. A sushi train restaurant complete with actual train. The last spot, also a brief 15- minute walk, is the PSU Food Cart Pod on SW 4th between Hall and College Street. There are over a dozen carts with a range of cuisine. We’ve got you covered! View lists of and directions to food carts. No matter where you live, whether in downtown Portland or in one of Portland suburbs, you’ll find a farmer’s market near you. Portland Farmer’s Market has been working over twenty years to bring fresh produce to the Portland community. They have six different locations throughout Portland proper, all setting up shop Spring through Fall (exact dates vary—check the website for details). If you are looking for a market outside of the city limits you could check out the Oregon Farmer’s Markets Association. They have a list of market’s across the entire state— Central, Coast, Willamette Valley, Portland Metro and more. 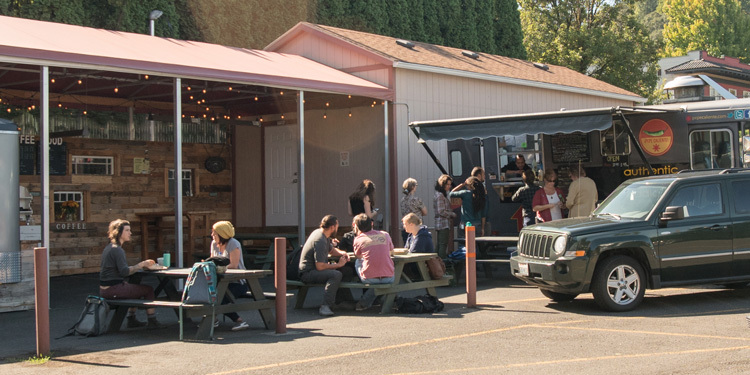 The People’s Co-Op Farmer’s Market runs year round—currently on Wednesdays from 2:00 – 7:00 p.m.. They’re located at 3029 SE 21st Avenue one block from Powell; meaning they are just a short distance from campus (on the other side of the Ross Island Bridge). Food Front is a cooperative grocery store that actively seeks out local producers and suppliers for their two stores. Alberta Co-op Grocery is a community owned cooperative on NE Alberta Street. So whether you’re looking to support a local coop or to purchase directly from a farmer’s market— Portland has many options. Portland has become an epicurean paradise. The city’s ever-diverse population is giving rise to a wide range of restaurants from one end of the city to another. Fresh local produce and other agricultural delights are offered to the public at the Portland Farmer’s Market, as well as many other local farmer’s markets throughout the city.